Disclosure: I was given media passes to check out HalloWeekends at Cedar Point. I paid for travel, food and souvenirs. I was not asked to post about my trip, but I am so you can read about an easily-frightened/sensitive child’s visit to HalloWeekends. 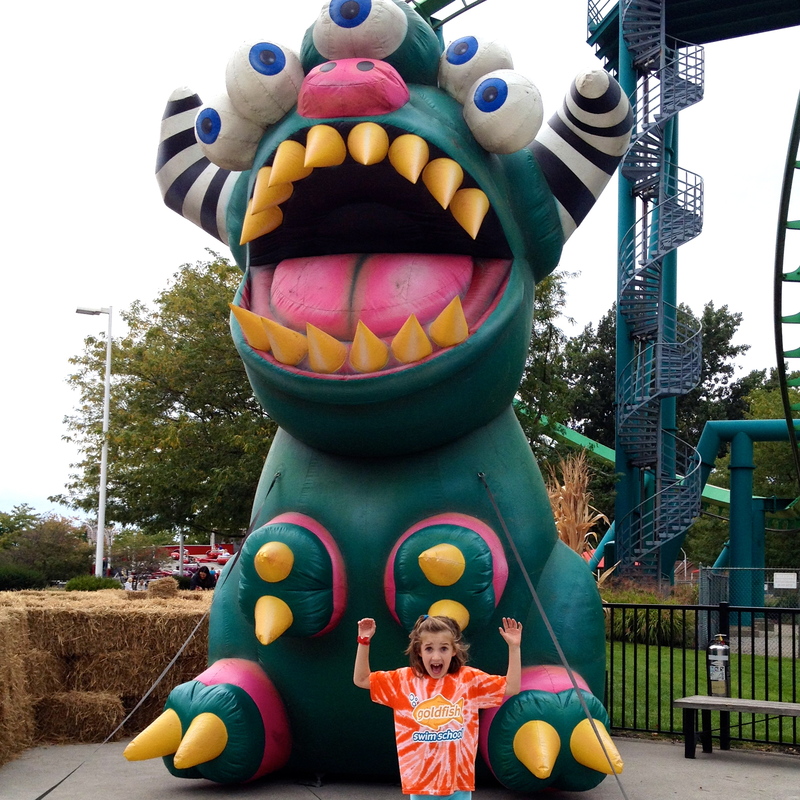 As part of her 7th birthday presents I told Matilda we’d be going to Cedar Point for HalloWeekends. In all my life, filled with many dozen Cedar Point trips, I have never gone during HalloWeekends, so I was as excited as she was. But, my sweet girl is also the one so frightened of anyone in costume that she hid in the bathroom when Slider visited the social suite. After much discussion with others we decided that a day at CP would be great, even with a little spookiness. My sister and her family joined us because I thought that having her older cousins around would help Matilda be a bit more brave in the face of a plastic skeleton. In typical fashion for my family, we arrived about 30 minutes before the gates opened. The kids took the time to map out our day. Last year Matilda was only tall enough to ride the Iron Dragon; now that she’s 48″ she had big plans to hit all 8 roller coasters that allow 48″+. 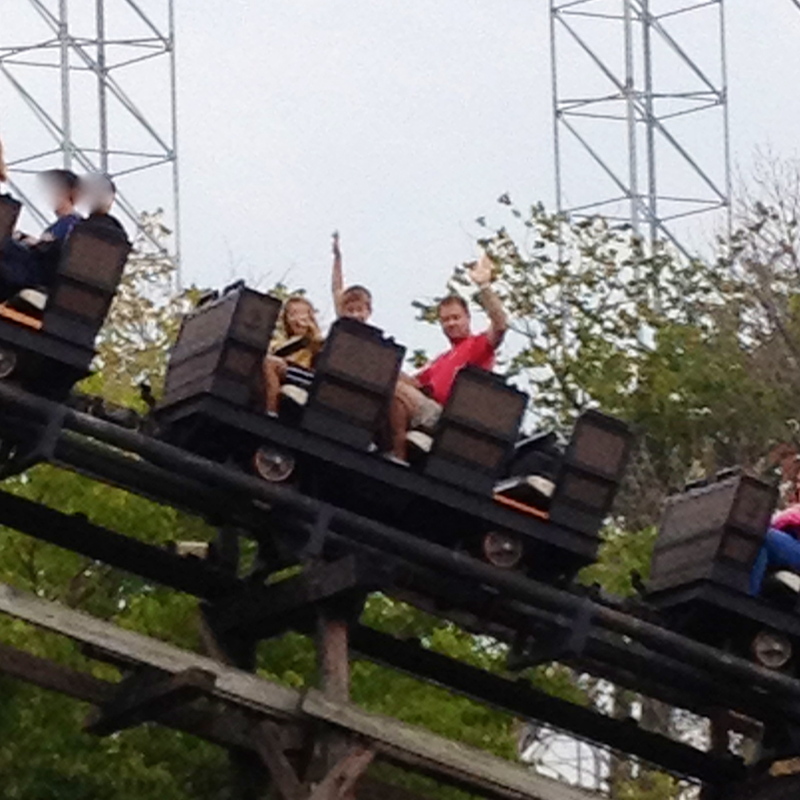 We thought a “warm up” ride on the familiar Iron Dragon would be a good start to the day. 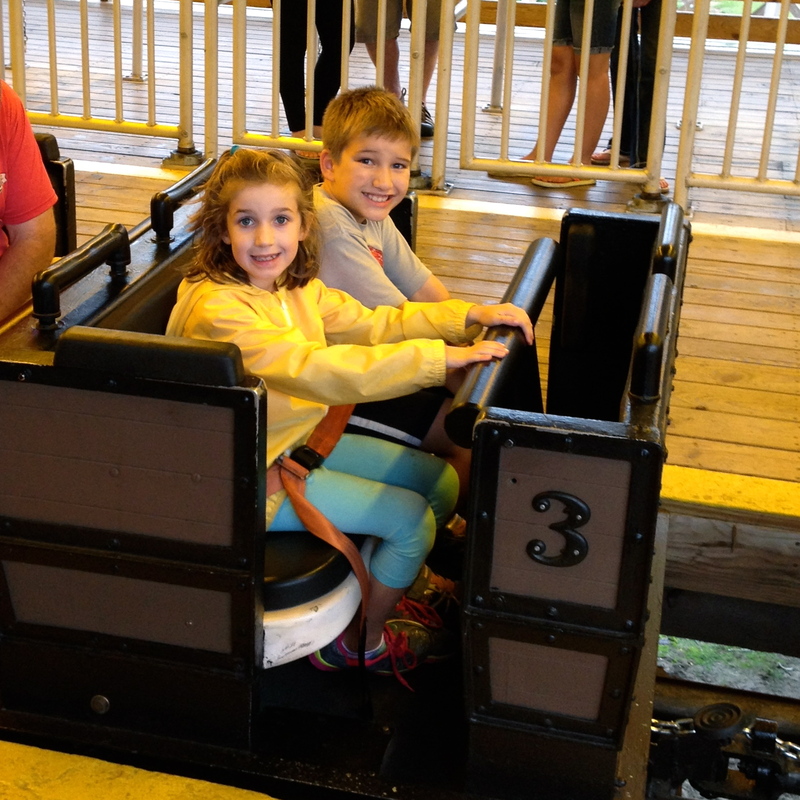 As we headed to the ride she was nervous – not about the ride but about seeing scary things in the park. 95% of the decor is tame (fake grave yards, plastic skeletons, bats in the trees, etc.) but we had passed two really creepy HalloWeekend billboards on our drive to the park and she was on high alert. What’s up with the terrifying clown fad? It needs to go away – it freaks ME out and she was super-anxious about seeing one inside the park. She kept her head down and a with tight grip on my hand we got to the Iron Dragon without incident. She was excited to show off her favorite ride to her cousins. Then we worked our way back through the Frontier Trail towards the Mine Ride. (Fun fact – my sister worked at the Red Garter Saloon on the Frontier Trail 22 years ago and the menu is still the same.) The trail was littered with pretty cool steampunk-type decor – nothing creepy as the mazes and haunted areas weren’t open yet. 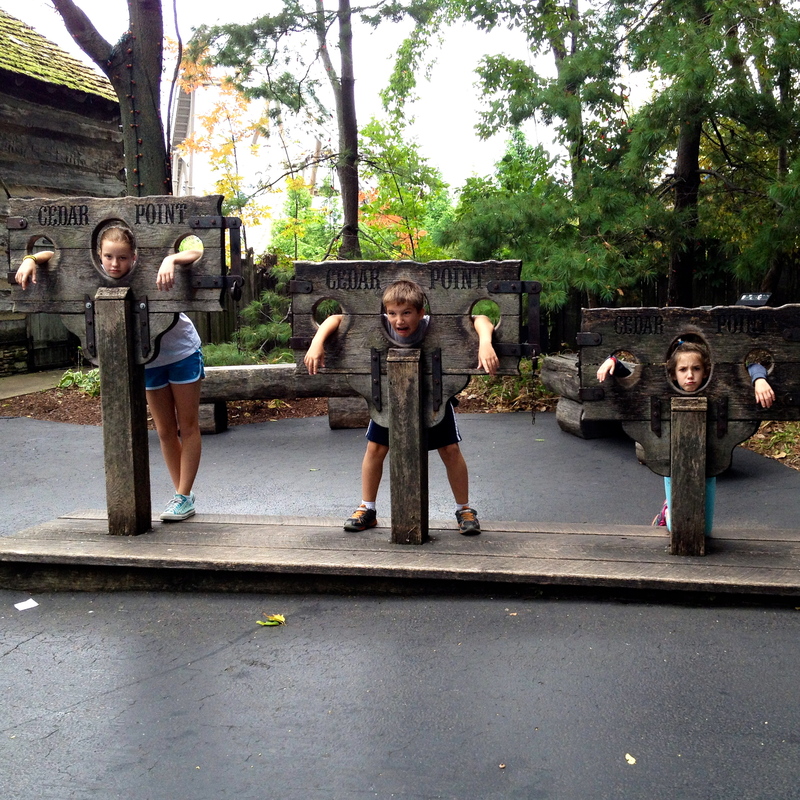 We of course stopped to get a photo in the stockade – my brother, sister and I have several of these from when we were growing up. We hopped right onto the Mine Ride and Matilda declared it her new favorite. She rode it a few more times throughout the day. After that we decided the kids were ready for the Gemini. Again, we hopped right on the ride with little waiting. My sister’s family in the blue train and Matilda and I in the red – we were off to the race! (Fun Fact – the Gemini was my first roller coaster back when I was Matilda’s age. I rode with my sister and about halfway up the first hill I decided I didn’t want to ride so I tried to climb out of the train!) This time Matilda was ready to beat her cousins in the roller coaster race but our train stopped midway up the hill – the blue train kept going. I was in a mild panic about a broken coaster and trying to keep Matilda calm when a park employee walked up the hill to confiscate a phone from the guy in the front seat. He was trying to photograph the ride so they stopped the train to take his phone away! They remind you before each and every ride “For safety reasons, taking pictures, videotaping and filming on rides is strictly prohibited” and they are NOT messing around with that rule. Anyway – off we finally went on Matilda’s biggest coaster yet! Her face after the first hill was pure white and wide-eyed. She clung to the harness but managed to smile a bit by the end. She said is was scary fun but didn’t want to go on it again. She was more upset about losing the race to her cousins than anything else! She also waited in the short line for the Magnum XL-200 but in the end the sight of that 200-foot first hill had her opt out of riding. We spent a lot of time on some of the “thrill rides” and this is where having her cousins with us was a plus – I didn’t have to ride any of the “spinny” rides with her (they make me motion sick). So she got to ride to her heart’s content and I stayed nausea-free. We checked out the kid-friendly Howl-O-Palooza area where Matilda literally jumped into my arms as we toured the Magical House on Boo Hill. 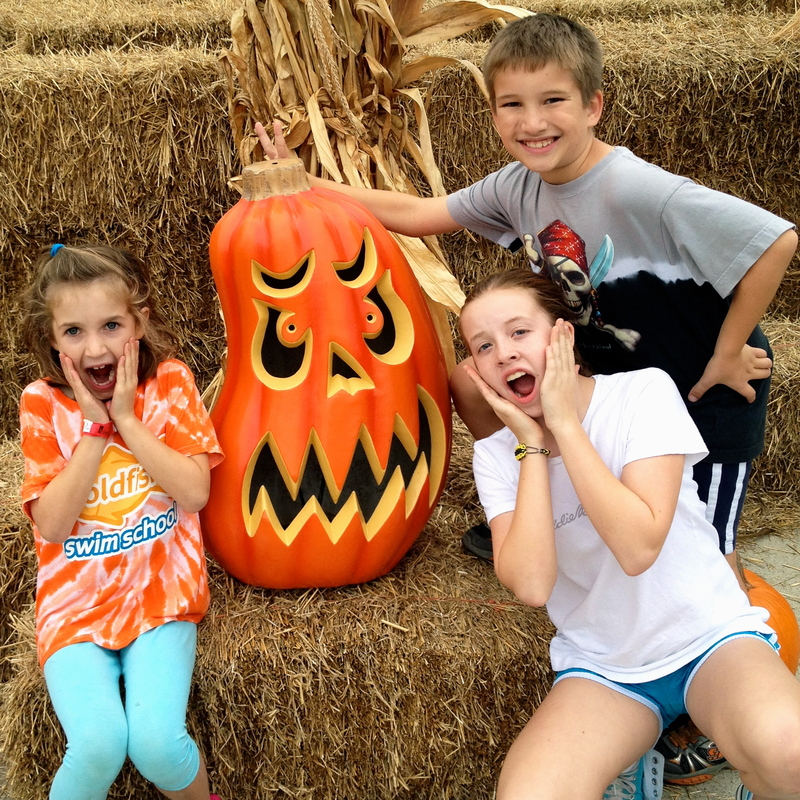 There was nothing scary in it – it was simply spooky! However Matilda is the kid who will bravely jump off a diving board and ride roller coasters yet freak out at the sight of a mechanical fake spider dropping down from the ceiling. But while we were in the area we also caught a ride on the Blue Streak, which was just re-opening after a brief rain. I had forgotten how much air time that ride gives you. It’s old but fun! We had a terrific day and by the end Matilda seemed unfazed by the decorations and knew to simply look away or cover her eyes if she saw something scary. And that was one of the reasons we went…so she could face her fears and learn to deal with them. A year ago she would have hid under my shirt and refused to do anything, so we’ve come a long way. 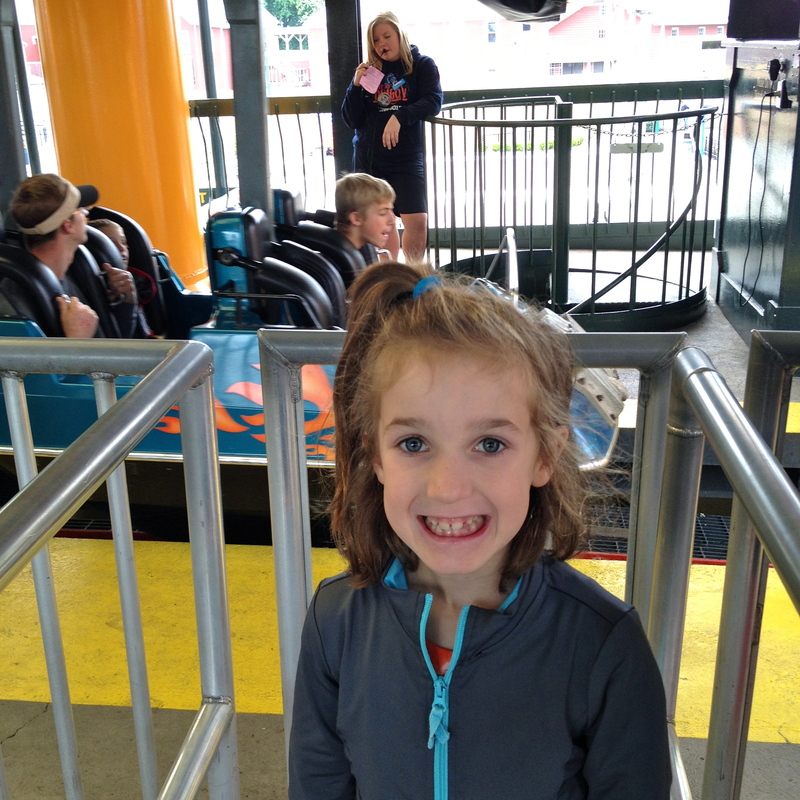 In the end she rode 4 roller coasters – she really wanted to ride the Corkscrew but it was closed when we were nearby. The Magnum, Millennium Force and Mean Streak will have to wait for next year when maybe those big first hills won’t seem so daunting. Would I go to HalloWeekends again? Well, Matilda said that while she DOES want to go back to Cedar Point next year, she doesn’t want to go during HalloWeekends. But this was right after telling me that the day wasn’t that spooky! So yes, I would go back simply because it was a great day – no lines, good weather (a few short-lived sprinkles didn’t slow us down), no crowds. 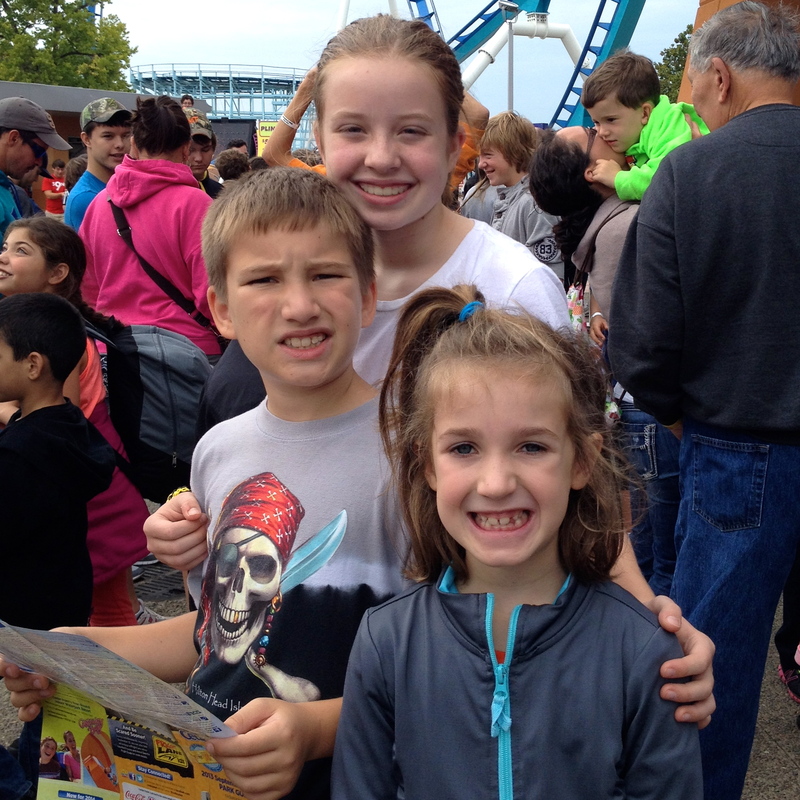 There’s no doubt that fall a great time to visit Cedar Point! Thanks again for inviting us…it was a great day! 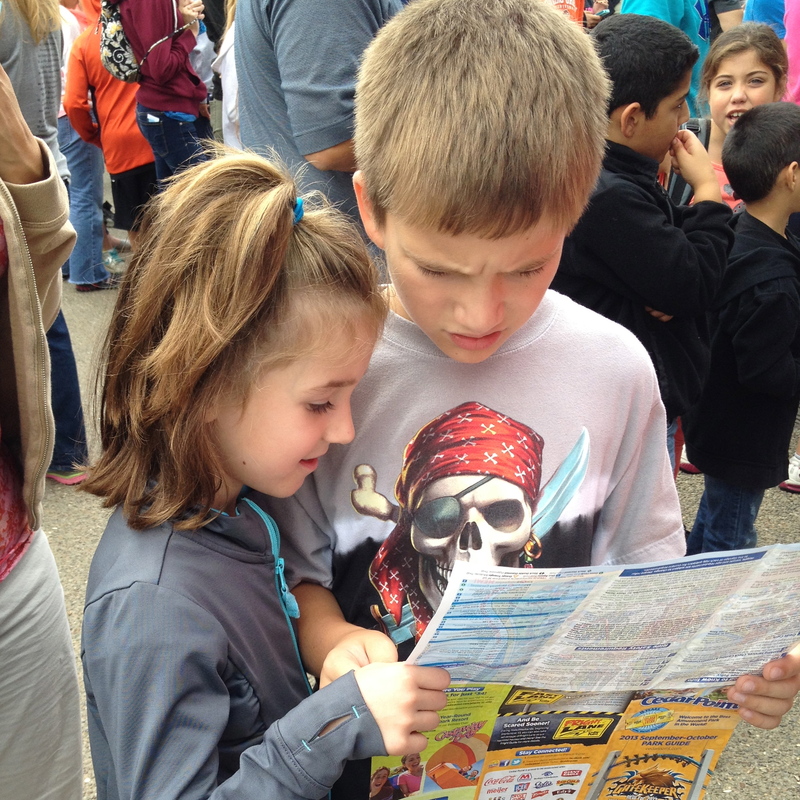 We will definitely go back again in the fall….not waiting in line was well worth it!